SEATTLE (AP) — The Seattle Mariners can’t seem to get their struggling bats back in a groove and end their freefall in the AL playoff picture. Toronto’s Marco Estrada became the latest to leave Seattle’s batters baffled, using his mix of offspeed pitches to take a no-hitter into the seventh inning of the Blue Jays‘ 5-1 win over the Mariners on Saturday night. 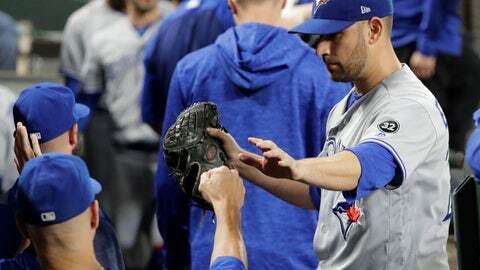 Estrada was pulled after walking Ryon Healy to open the eighth inning, leaving to a standing ovation from the thousands of Toronto fans in attendance. Estrada struck out four and allowed one earned run when Healy scored on Chris Herrmann’s sacrifice fly. Seattle has lost five straight and fallen 2 ½ games back of Oakland for the second AL wild card. The Mariners’ slumping offense looked even more meager against Estrada, who entered the day with a 4.90 ERA and had allowed four earned runs in four innings in his last start. Estrada also induced plenty of weak contact as Seattle struggled to make the adjustment between speeds. “You’ve got to try to simplify things a little bit. That’s what we’ve got to get to. Instead of making it harder, make it a little simpler because what we’re doing right now is not working,” Seattle manager Scott Servais said. Travis has seven RBIs in the first three games of the series; he had seven RBIs the entire month of July. “If you’re not aggressive against (Paxton) it’s even tougher. We stayed aggressive tonight,” Travis said. Paxton was unhappy with his curveball and it allowed the Blue Jays to look for mostly fastballs. Toronto added two more runs off Seattle’s bullpen on Justin Smoak’s RBI single off Sam Tuivailala in the eighth and Brandon Drury’s double off James Pazos in the ninth. Toronto has scored 10 runs — seven earned — off Seattle’s bullpen in the first three games of the series.